This pen looks just like an ordinary pen, no one will ever notice there is a camera in the pen! Our product is used by lawyers, private investigators, police officers, students, office workers, spouses, etc. 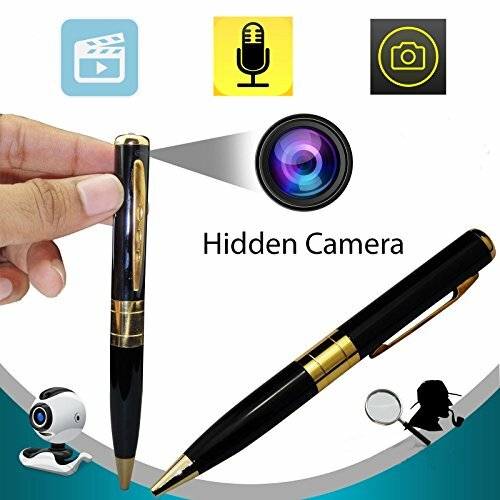 Concealed Camera in the Pen - To Film People without Their Knowledge: This camera is just like a normal pen, which is incredible covert and secret, inconspicuous to the subject being shot. Video Recording - Perfect as Meeting Recorder: This pen can record at 720X480P HD video at 30FPS and take pictures of 1280X1024 JPG. It can act as meeting recorder, evidence collection device, etc. Portable Mini Pen Cam - Just Plug it in Your Pocket and Start to Play: This camera is really small and tiny, easy to carry, you can use it anywhere anytime conveniently. It can also be used as a normal ballpoint pen with included refill (1 piece). Long last working time: Every 50 minutes automatically saved file you have taken, then continue, which is suitable for meeting recording. Remember to plug SD card (not included) before using: Do not forget to plug a SD card, or the pen will shut down after a few seconds. Easy to use with clear manual: Just one button at the top of the pen need to be operated, takes 3 minutes to read the instruction and you will know how to record video and then export it to the computer.